Lying and cheating are the norm for these girls, but the show weakly tries to justify their awful behavior. At one time they had a fifth friend, who was the cruelest of them all. This friend disappeared in a mystery none of the girls will talk about, though they begin receiving messages from their old friend once her body is found. This storyline does not move nearly fast enough, because there is too much relationship junk to wade through. It took two seasons to discover who was sending mysterious messages, pretending to be the deceased friend, and in season three we are still getting bits of flashback of Alison’s final days alive. At least “Desperate Housewives” knew to leave the dead behind after a season or two. There are other new storylines, but it all begins to sound like the same old dribble. 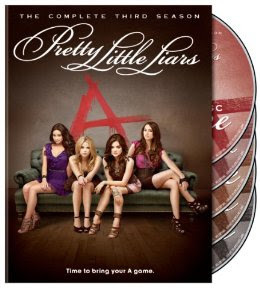 The 24 episodes from season three are all included in this set, along with more than a few special features. There is a gag reel and deleted scenes, not to mention a bonus webisodes and an alternate ending to an episode. There are also a few featurettes best suited for die-hard fans.